Cape Town is rated as one of the top 10 cities to visit in the world. This hardly comes as a surprise when considering the magnificent natural beauty and the wonderful array of activities in Cape Town. This world-class destination is always abuzz with people enjoying the city’s many attractions. However, from October when the holiday season starts looming and Cape Town summer weather sets in, the atmosphere in Cape Town is almost electric as people anticipate all the great things the new season will bring. Among the many things there is to know about Cape Town, one of the most searched about topics include top activities in the Mother City. If you are in search of the best things to do in Cape Town in summer we invite you to read on. To help you plan the perfect vacation we have put together our top five summer activities – from the best of Cape Town’s beaches, al fresco restaurants and summer markets to a range of romantic and fun things to do in Cape Town for couples. Cape Town summer months are simply spectacular. From early December to March, Cape Town summer weather is at its best with temperatures averaging 16-26 degrees Celsius, or 61-79 degrees Fahrenheit. There’s no better time to enjoy the ocean; the Mother City’s oceans are indeed a big drawcard for visitors – those who prefer to play above the waves and those who are curious about the underwater world. There is a variety of snorkelling sites along the Cape Peninsula, boasting shipwrecks and incredible coral reefs. And, as one would expect, there is an abundance of wildlife to be encountered, including playful seals, dolphins, sunfish and even penguins. With the ocean’s rich marine life, snorkelling has become one of the most popular summer activities in Cape Town. Ocean Experiences have tailored an exclusive snorkelling excursion to the smaller, lesser-known seal community at Strawberry Rocks in front of the Twelve Apostles. With fewer boats and other divers around, you can expect a more private snorkelling experience that will allow you to really immerse yourself in the beauty of the marine life. The tour includes a picturesque drive from the V&A Waterfront past some of Cape Town’s most popular sites, including Lion’s Head, to one of the biggest seal colonies found on the Atlantic seaboard. Ocean Experiences focus on conservation and education, so in addition to interacting with the seals in their natural environment, you will learn about the Cape fur seals’ habits. During Cape Town’s summer months hot, clear days seem to last forever and that’s what makes this time of year so glorious. There is no better way to enjoy the sunshine than lazing on one of the many picture-perfect, white sand Cape Town beaches – after all, they are top among the reasons people make their way to the city each year. The Mother City offers sunbathers a myriad of choices when it comes to seaside spots – from wide, sprawling expanses of white sand to tiny, secret alcoves. Of all Cape Town’s beaches, Camps Bay beach is perhaps the most famous. This palm tree-lined strip with the Twelve Apostles as a backdrop has a tidal pool, to-die-for sunsets, and a multitude of trendy and upmarket restaurants and bars, which make it an idyllic summer setting. If you prefer a more private spot, Llandudno is a must-visit. Framed by giant granite boulders and blue skies, the beach curls itself into the base of the mountain rock between Camps Bay and Hout Bay. This low-key beach, sitting on the edge of an elite residential area, is a paradise for surfers and sunbathers alike. Llandudno is also the access point for the walk to Sandy Bay, an isolated beach popular with nudists. Another top contender for the top Cape Town beaches is Clifton, which has four beaches separated by granite boulders. Pulsating with the energy of the bronzed and beautiful, Clifton’s beaches are the most sheltered in Cape Town, which means that it can generally be relied upon for perfect conditions, even when the wind blows. Blouberg beach, situated approximately 30 minutes out of Cape Town on the West Coast, offers a postcard view of Table Mountain and Lion’s Head – it is an absolutely spectacular spot to enjoy sundowners, especially in summer when the sun only sets around 8pm. Clear, blue skies and long, warm evenings is a standard feature of Cape Town summer weather, which is part of the reason the Mother City has such a big outdoor culture. The city’s nature-orientated lifestyle has given rise to a smorgasbord of convivial outdoor markets where visitors can buy a range of fresh and local produce while enjoying the lovely weather. Oranjezicht City Farm (OZCF) Market, located at the historic Granger Bay site at the V&A Waterfront, does not only boast stunning sea views but caters to all palates and preferences, from carnivores to vegans, chocoholics to diabetics with a wonderful array of artisanal food stalls. You will also find fresh-from-the-patch vegetables and herbs, fruit, bread, organic dairy products, raw honey and ethically sourced meats and seafood. The OZCF Market is open every Saturday 9am to 2pm and Sunday 9am to 3pm (all weather). Visitors can pick their own harvests on Saturday mornings at the OZCF farm itself, which is located on 87 Upper Orange Street in Oranjezicht. On a bright, sunny day a scenic drive to Root 44 Market makes for a lovely outing. Located on the corner of the R44 Road and Annandale Road near Stellenbosch, the market offers an array of craft and homeware stalls perfect for leisurely browsing, as well as a selection of delectable treats, local wines and craft beers to be enjoyed with live entertainment. Surrounded by picturesque vineyards and trees, this all-weather market has outdoor spots for fine days, as well as sheltered seating areas, making it one of the best things to do in Cape Town when the wind blows. Root 44 Market is open every Saturday and Sunday, 10am to 4pm. The Lourensford Market in the trendy Helderberg Basin in Somerset West is another highlight on the list of top places to visit in Cape Town. Set on one of the most renowned and scenic wine estates in the country, this Cape Town summer market has over 70 vendors selling a vast array of quality fresh produce, art and crafts; while Lourensford Estate’s superb wine collection complements the inevitable festive atmosphere. Visitors are spoiled with sprawling lawns, majestic trees and award-winning gardens featuring an interactive fountain. The estate’s Twilight Market is open every Friday from 5pm to 9pm and visitors can enjoy the Sunday Market from 10am to 3pm. Of all the fun things to do in Cape Town for couples in summer, few tops relishing a beautifully prepared meal at an open-air restaurant where you can soak in the sun and spectacular views. Summer-style dining is one of the most popular Cape Town summer activities; and to cater to the great demand, the city has a myriad of restaurants that fit the bill. A gem among the Mother City’s al fresco restaurants is Silo Hotel’s Rooftop. Sitting on top of the tallest building in the V&A Waterfront, the Silo Rooftop offers breath-taking 360-degree views of the city and Table Mountain. Poolside lounging is complemented with treats from the tempura bar, pulled pork sandwiches and a selection of healthy snacks while guests can indulge in fresh oysters and flowing bubbles until sundown. The rooftop location is open to the public by prior reservation. Bistro Sixteen82, nestled in the Constantia Valley adjacent to Steenberg’s winery, is another sublime al fresco venue. This highly acclaimed establishment, surrounded by indigenous gardens, has a terraced dining area that leads to reflective water features. Views of the magnificent stone mountains and expansive Winelands complete the picture. However, the setting is only part of what makes this restaurant so exceptional. Renowned for its relaxed new-bistro cuisine focusing on seasonal dishes skillfully prepared by chef Kerry Kilpin, Bistro Sixteen82 has been recognised on the list of 20 of the World’s Best Winery Restaurants by Canada’s renowned Wine Access magazine. Local accolades include prominent mentions in Fleur du Cap’s Top 100 Places. Perfectly pairing a magnificent setting with world-class cuisine, Bistro Sixteen82 most definitely makes our list of the top romantic things to do in Cape Town when the sun is out. Couples in search of romantic things to do in Cape Town during the summer months are spoilt for choice. However, if you really want to put a twinkle in her eye, we invite you to visit the Shimansky Diamond Experience and Jewellery Showroom in the Clock Tower at the V&A Waterfront. The sleek, air-conditioned space, conveniently located in one of Cape Town's top tourist attractions, features an array of Shimansky designs, including engagement rings, anniversary rings, bracelets, earrings, pendants, necklaces and fancy dress rings. 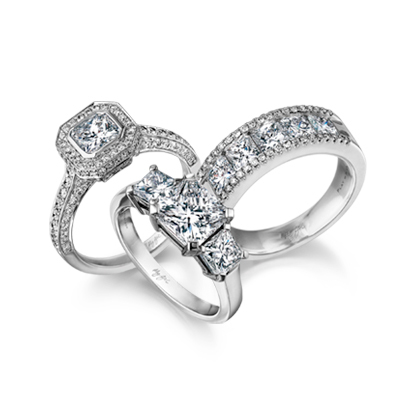 Here you can leisurely browse Shimansky’s complete range of iconic collections: the Millennium collection, the Evolym collection, the I DO diamond engagement ring, Ayanda – The Queen of Tanzanite collection, the My Girl diamond collection and natural fancy colour diamonds like the breathtaking Shimansky Fancy Yellow diamond collection. Glimmering brightly as the African sun in magical golden hues, Shimansky fancy yellow diamond creations are truly exceptional. Hand-selected direct from Kimberley and the West Coast regions of South Africa, these highly sought-after diamonds radiate like rays of golden sunshine. Catching a glimpse of a fancy yellow diamond reflecting the dancing sunrays in a bright display of colour is truly mesmerising, especially when glimmering gorgeously against sun-kissed skin. If you are planning a holiday in the popular Mother City this summer, we invite you to visit The Diamond Experience Clock Tower or any of the other Shimansky Showrooms with jewellers in Cape Town. Whether you are in search of a one-of-a-kind Shimansky engagement ring, the perfect anniversary ring or you simply want to treat the love of your life with a beautiful diamond or tanzanite creation, we are sure you will find a piece that speaks to your heart. You are also welcome to collaborate with one of our designers in creating your own bespoke jewellery design that is just as unique as you are.